The greatest flower show ever staged in Thailand is the Chiang Mai Flower Festival. This Fiesta features a procession of floats made out of vibrant flowers, beautiful Thai's hill tribe girls in their traditional dress, a Miss Chiangmai Flower Festival beauty pageant as well as loads of outlandish plants and flowers exhibition. The Chiang Mai Flower Festival has been running for over 40 years and celebrates the beautiful blooming flowers annually. The Festival is held during the first weekend of February which happens to be the concluding part of the cold season, and it runs annually for more than three days at the beginning of February. 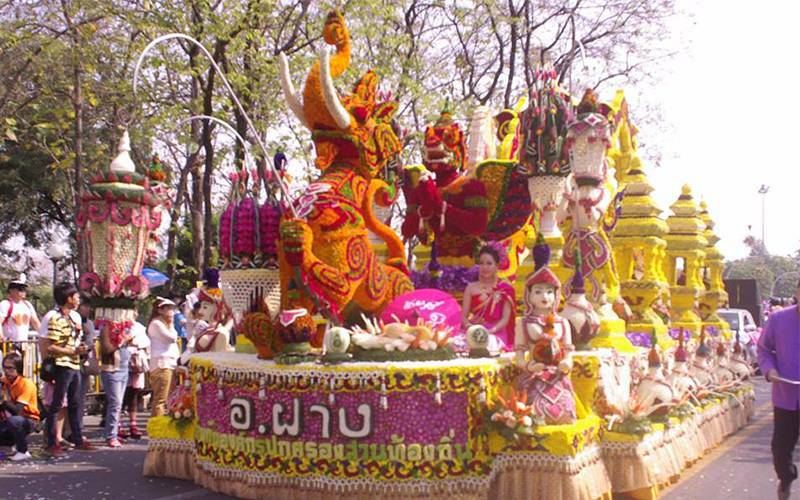 The event hasn't stopped to attract thousands of tourists to Chiang Mai on a yearly basis. The first day of the festival typically encompasses an agricultural exhibition and demonstration of floral arrangements as well as landscaping trends. Succeeding days involve an extravagant show of fabulous floats of flowers; an event that showcases local artworks, music concerts and display of stunning decorative plants. The city is packed with vibrant colours ranging from the electric orange and lilac colours of the bougainvillea to the velvety blossoms of petunias the shade of pink, white and purple. The persuasive red of the poinsettias, subscribed by a lot of people at Christmas and New Year, is resounded by beds of scarlet salvias. Homes and shop proprietors alike line the city streets with colourful flower boxes. 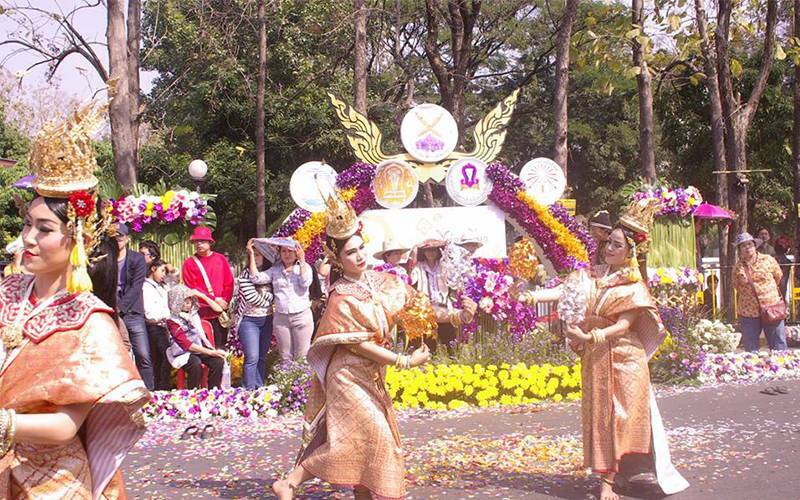 The sheer cornucopia of colour that the flower fiesta and carnival pertinently gave Chiangmai city its name "Rose of the North." There will be a lot to eat and drink throughout the fair with typical warm weather in the daytime and pleasantly cooler nights. The best place to be at this of the year is at the Chiang Mai Flower Festival where you can enjoy this magnificent cultural occasion! Typical Flower Fiesta Parade begins in the early hours of Saturday, but the whole thing changed in the year 2014 when the parade started extending till afternoon and even evening time. The Flower Festival parade is not only limited to the exhibition of flowers alone, but it also includes agricultural demonstration and fair, competitions and as usual, demonstration of flower arrangement. Other activities include ornamental plants exhibition, mini garden landscaping, a festival of food, native merchandises fair, musical shows, Lanna performances and many more. 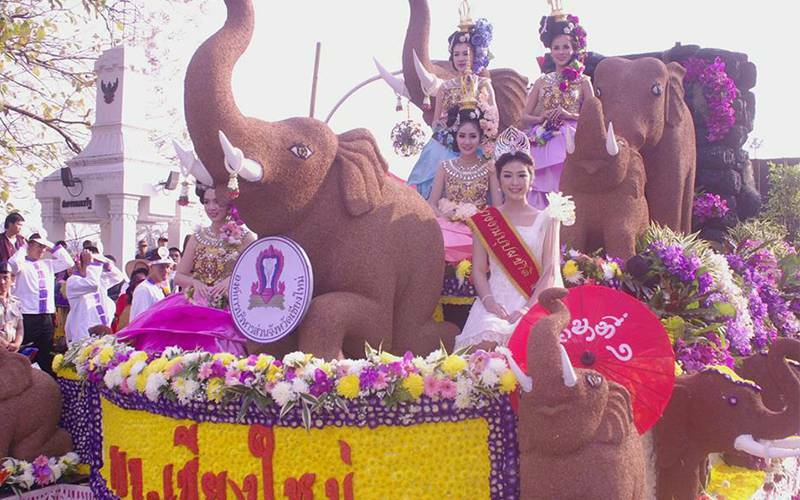 The line-up for the flower parade starts at Charoen Muang Road, all the way to the train station at Nawarat Bridge. The show begins at 4 pm and then move to Tha Phae Road before moving the Tha Phae Gate after which it turns left and follows the channel close to Suan Buak Haad. The flower parade typically moves gently with a frequent stopover. A blend of western parading bands from indigenous schools and drumming groups are spread along the floats. There are also Thai dance performances from local dancers in traditional costumes, and sometimes the partakers of the flower parade give out flowers to the onlookers. Aside from the flower festival parade, another side attraction is the competitions for the most attractive and innovative display and the best float. 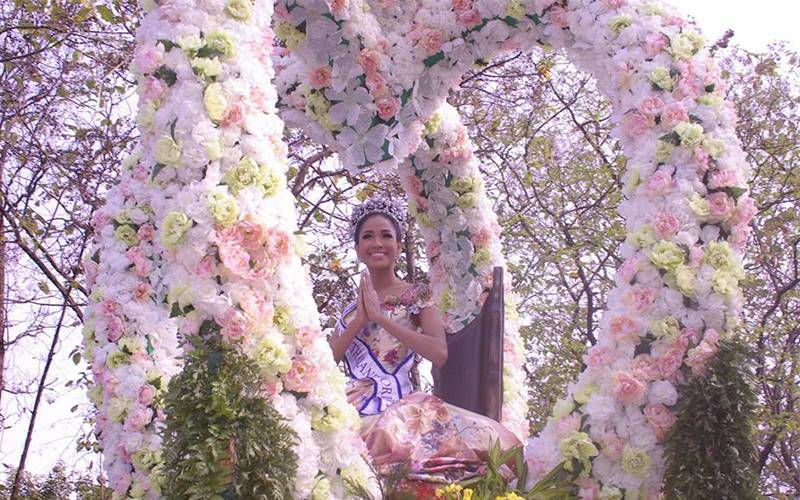 Many of the girls at the top of the gaily ornamented floats and carriages are contenders for the Miss Chiang Mai Flower Festival contest. 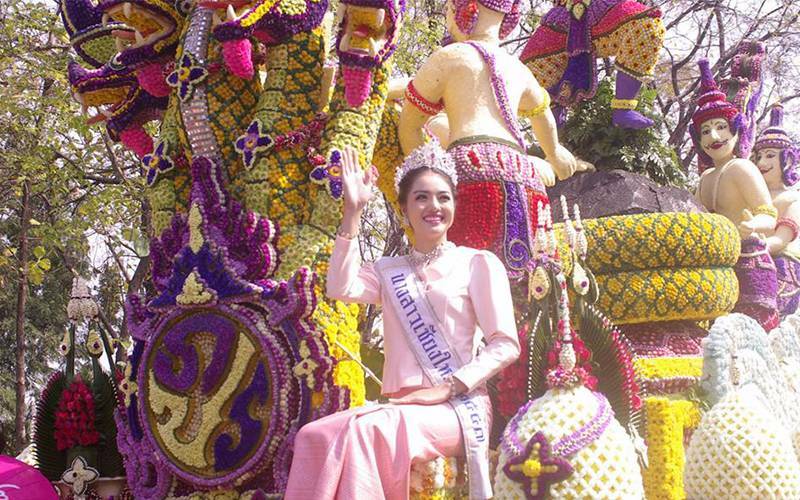 By late afternoon the serious part of the festival which is choosing the Chiang Mai Flower Festival Queen initiates. Loud rock music characterizes this event, and liquid refreshments aid the discussions. The party extends into the evening until the Flower Festival Queen is chosen.